Dwarf mongooses remember previous cooperative acts by their groupmates and reward them later, according to new work by University of Bristol researchers, published today in the journal Proceedings of the National Academy of Sciences. Market trade was once considered the domain of humans but the exchange of goods and services is now widely recognised in other animals. What the new research shows is that mongooses have sufficient cognitive ability to quantify earlier acts of cooperation and to provide suitable levels of delayed rewards. Senior author, Professor Andy Radford from Bristol's School of Biological Sciences, said: "Humans frequently trade goods and can track the amount they owe using memories of past exchanges. While nonhuman animals are also known to be capable of trading cooperative acts immediately for one another, more contentious is the possibility that there can be delayed rewards." Lead author, Dr. Julie Kern, also from Bristol, added: "There have been hardly any suitable experimental tests on wild animals, especially non-primates. By working with groups of dwarf mongooses habituated to our close presence, we could collect detailed observations and conduct experimental manipulations in natural conditions." The study is the first to provide experimental evidence in a wild non-primate population for delayed contingent cooperation—providing a later reward to an individual for the amount of cooperation it has performed. It also offers convincing evidence of cross-commodity trading, whereby individuals reward one type of cooperative behaviour with a different cooperative act. In this case, grooming was traded for sentinel behaviour, which involves an individual adopting a raised position to look out for danger and warning foraging groupmates with alarm calls. Dr. Kern said: "We began by using detailed natural observations collected over many months to show that individuals who perform lots of sentinel duty also receive lots of grooming and are well-positioned in the group's social network. But, to prove a causal link, we needed to nail a tricky field experiment." Professor Radford added: "Over three-hour periods when groups were foraging, we simulated extra sentinel behaviour by a subordinate group member using playbacks of its surveillance calls—vocalisations given to announce it is performing this duty. At the sleeping burrow that evening, we monitored all grooming events, especially those received by the individual who had had their sentinel contribution upregulated." The researchers found some striking results. On days when an individual was perceived to conduct more sentinel duty, it received more evening grooming from groupmates than on control days (when its foraging calls had been played back during the preceding foraging session). Moreover, the individual who had had its sentinel contribution upregulated received more grooming than a control subordinate in the group. Grooming has long been considered an important tradable commodity in social species, being used as a reward in various contexts. 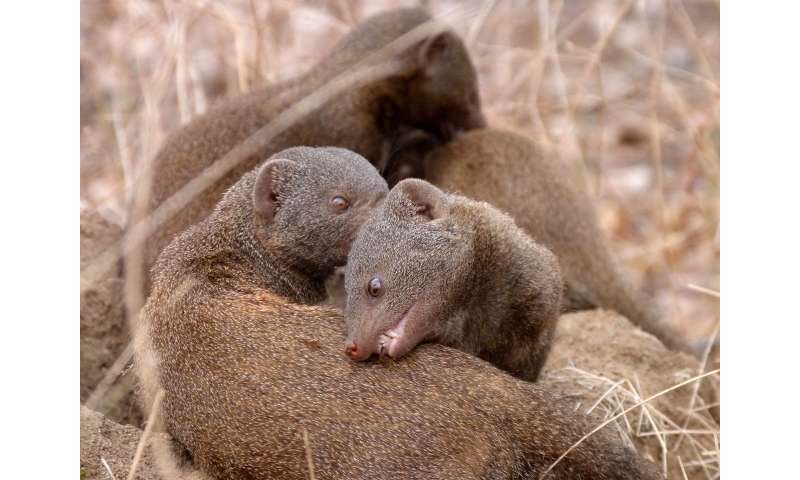 The new work shows that this grooming reward does not need to occur immediately after the relevant cooperative act; the increased grooming by mongooses took place at the end of the day when the mongooses had finished foraging and returned to their sleeping burrow. 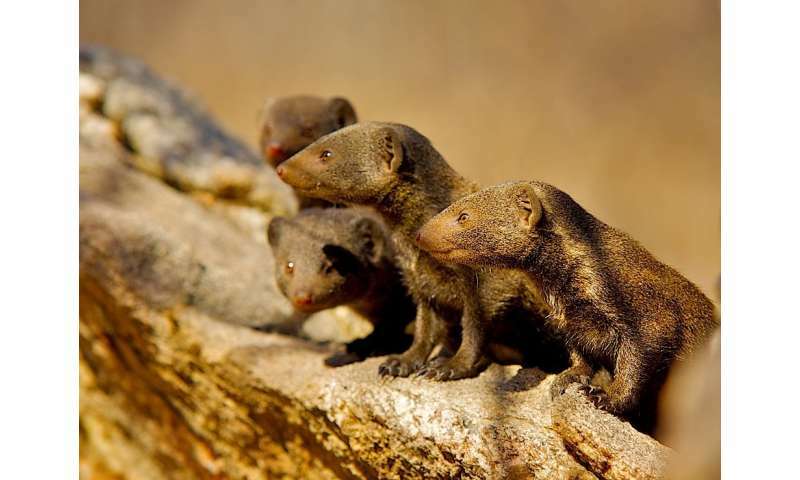 Dwarf mongooses are Africa's smallest carnivore, living in cooperatively breeding groups of 5-30 individuals. 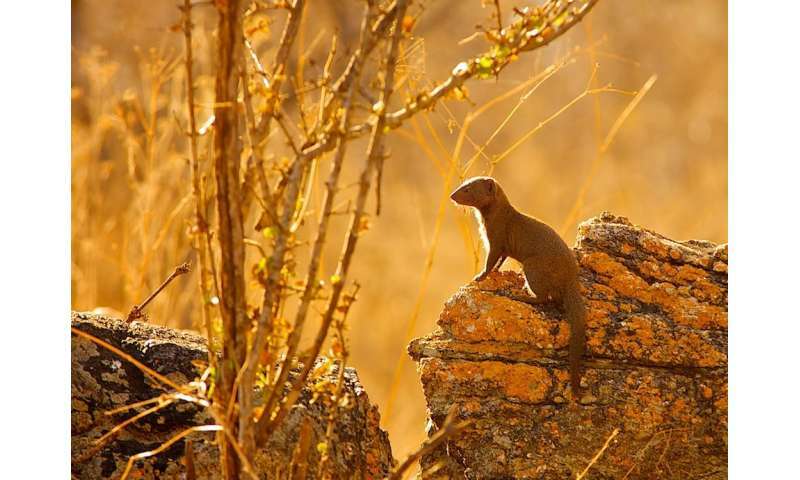 The work was conducted as part of the Dwarf Mongoose Project which has studied habituated wild groups continuously since 2011. The study animals are individually marked with blonde hair dye, are trained to climb onto a balance scale to weigh themselves, and can be watched from a few feet away as they go about their natural behaviour in ecologically valid conditions.